Barnabas House is a detached house dating from the 1870s, understood to have been built for the Admiralty and owned by the Crown Estates until the 1970s. 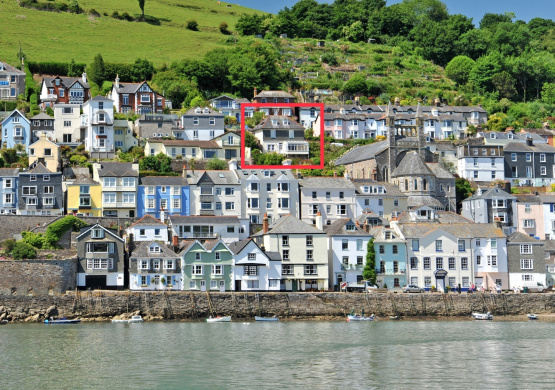 The spacious accommodation is arranged over four floors and there are stunning River Dart views from all the principal rooms and from the large decked terrace. This charming property is full of character and is situated within walking distance of the town centre and harbour. The open plan living room has a conservatory style sun room to one end maximising the stunning river views and the dining room also benefits from similar views. The kitchen/breakfast room on the lower ground floor has access to a large decked terrace, providing ample room for entertaining or enjoying the views. There are three bedrooms, one en suite and the family bathroom has a free standing bath and a shower cubicle. From the terrace steps lead down to the remainder of the garden consisting of a series of steps and pathways with shrub and flower borders. A single garage located nearby is available for sale by separate negotiation.